The Vegan Magpie: Holland and Barrett sale! Hello! 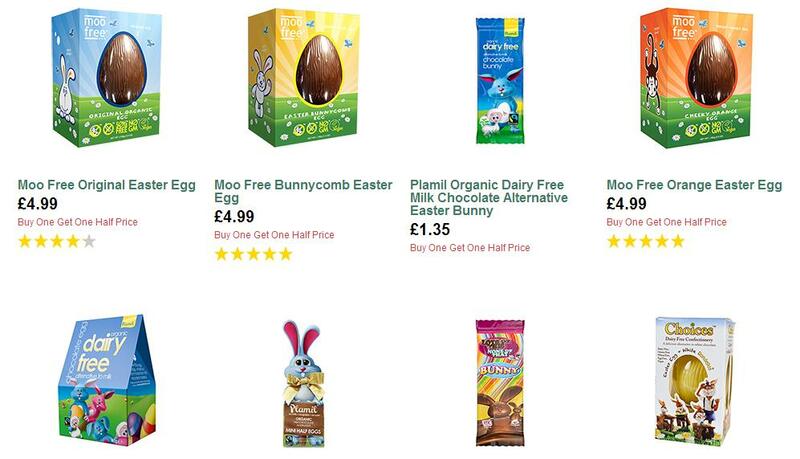 Holland and Barrett are currently doing their (quite frequent) buy one get one half price offers, with a lot of vegan products being part of it. It's on for the rest of the week! As well as including products such as Ten Acre crisps, Follow Your Heart Vegan Egg, their own brand 'Veg Out' pastries (not all vegan! May sound silly, but the scotch egg has an actual egg in it. Since vegan eggs are appearing I just wanted to make that clear) and Nooch (nutritional yeast), their Easter range is also included. Yaaaay! Just for examples. It's worth noting, Morrison's are currently selling Moo Free eggs at 3 for £10.00, however if you don't want 3, this may be a better option in the long run as you ultimately spend less. Holland and Barrett are also generally more expensive so a quick price check elsewhere on google wouldn't hurt before buying them. However they have a great range include Cocoa Libre, Plamil and Booja Booja (definitely a good one for a deal!). This deal is available in store and online. H&B also have a 'better than half price' deal happening, as well as £5 off £30 and £10 off £60, which I believe can work along side the buy one get one half price offer. Woohoo! As always, please check you're happy with the prices before you buy!